The next time it rains, watch the water run off your roof, across your driveway, and down the street. Everywhere you go, water is on its way to the nearest stream, lake, river, or wetland. Some of the rain evaporates back into the air, some rain soaks into the ground, and some rain travels over the surface of the land. Accidental spills, leaky storage containers, and whatever else ends up on the ground. The polluted stormwater runoff then rushes into nearby gutters and storm drains and into streams, lakes, rivers and the Bay. In most areas, stormwater runoff enters these waters without being cleaned of pollutants. These pollutants may harm or kill aquatic life, reduce the beauty of the natural resources, and impair waters to the point that they must be closed to fishing and swimming. Tip of the Mitt Watershed Council's "Stormwater Matters" encourages local residents and visitors of the Little Traverse Bay Watershed to help prevent stormwater pollution and protect Little Traverse Bay. Here are a few things you can do to help keep polluted stormwater runoff from entering our beloved Little Traverse Bay. 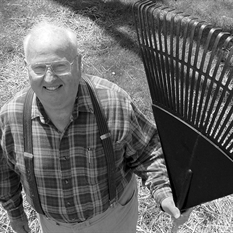 You can make your own riches by composting your yard waste. Leaves, grass, and other yard debris make excellent compost. However, invasive plants should not be composted. 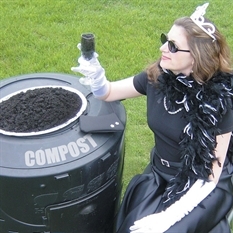 Compost saves you money, is great for your lawn and garden, and helps protect water quality. Backyard compost bins are available through the Emmet County Drop-off Center. Visit http://www.emmetrecycling.org/i-want-to-get/backyard-composting-bins/ for details. Rake yard waste into a compost pile, it can help keep organic materials from washing into the storm drains and nearby lakes and rivers. Why rake when you can mulch? Keep your leaves on top of the grass and run over them with the lawn mower. They make great fertilizer. No place to compost? No problem! Drop of your yard waste for free at the Emmet County Drop-off Center on Pleasentview Road in Harbor Springs. When it rains, soil and sediment can wash into our lakes and streams. Sediment pollution clouds the water, making it difficult for aquatic plants to grow and can destroy aquatic habitats. PLANT grass seed, native plants, shrubs, or trees. For more information, visit our native plants page. MULCH bare soil and seed with grass clippings, shredded bark, pine needles, and leaves. This reduces weeds and keeps soils moist for plants to grow. WATER new plants regularly during the first couple of weeks to be sure they will thrive. If fertilizers are necessary, use natural compost instead of commercial fertilizers. Spreading it on too thick? 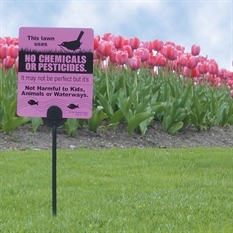 Over application of fertilizers is a significant source of pollution to water. Use the proper amount of fertilizer to keep your lawn green and prevent algae blooms in our lakes and streams. It’s a waste of money to apply fertilizer to your lawn it if doesn’t need it. 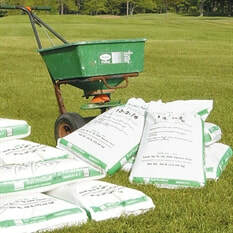 The only way to know how much fertilizer your lawn needs is to have your soil tested. Contact your local MSU Extension Office for an inexpensive soil test that will help you determine which, if any, nutrients your soil needs. Avoid overwatering your lawn, too. Consider using a soaker hose instead of a sprinkler. Excess water flows off your lawn picking up debris, chemicals, dirt, and other pollutants and carries them to nearby lakes and streams. Maintain greenbelts along shorelines to prevent sediments and excess fertilizers from washing into waterways. When you cut your grass too short, the roots die back. 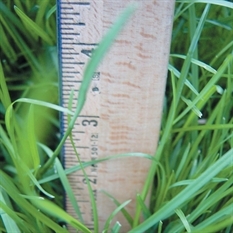 Allowing your grass to grow taller (at least 3 inches) will result in deeper roots and a better lawn. Taller grass absorbs more rainwater so that less runs off during storms. Less runoff is good for keeping Little Traverse Bay clean. When you mow the lawn leave the clippings. Your lawn will benefit from this natural fertilizer. Enjoy the lush life. For the nicest lawn in your neighborhood, mow high! Fertilize your lawn (grass will use nutrients from the soapy water). Protect water quality by keeping soapy water out of storm drains and ditches. Anything that reaches your storm drain is headed right for the nearest waterway. No lawn? You can still be a hero. Take your car to a car wash where the wastewater is managed before it goes to the Bay. Is your yard to DIE for? Pesticides kill bugs and herbicides kill weeds. Both can do serious damage to the things we love most, our family and pets. These chemicals can wash into nearby waters and harm other things we love - fish and fish food (aquatic bugs). Pests are annoying but polluted water is worse. Stop aphids by applying soapy water to plants. Drown slugs in saucers of beer. Discourage mosquitos by removing standing water. Some of the best things in life are free. Rainwater is one of them. Place a rain barrel beneath the downspout on your gutters to collect rainwater from your roof. Rainwater is relatively free of dissolved chemicals, such as chlorine and lime, which can be harmful to plants. Reduce the runoff from your property and help protect water quality. Help your houseplants and flower beds to thrive. Save money on your water bill. 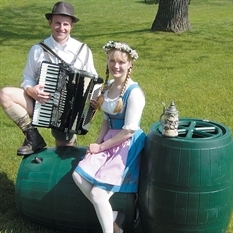 To learn more about rain barrels or to purchase on from the Watershed Council, visit our Rain Barrel page. Hosing off the sidewalk and driveway may seem like the easiest way to clean it, but it is also the easiest way to wash pollutants into the lake. Break out the broom and give it a sweep. Dirt and leaves can be swept back onto the yard. Sweeping saves money on your water bill and is less wear on your well pump. 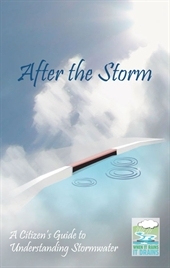 Make a clean sweep for you and for the waters you love. 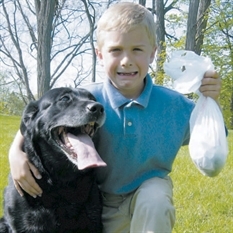 Pet waste can be a source of bacteria and excess nutrients in our local waters. Leaving pet waste on the ground increases public health risks by allowing harmful bacteria and nutrients to wash into the storm drain and eventually into nearby waters. 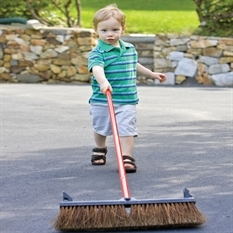 Unlike other “thankless” jobs, this one will put you in good favor with your family and neighbors. Is your drain a toxic waste dump? It is if you pour hazardous wastes into it, such as motor oil or cleaners.Chances are they are going directly from your storm drain to nearby waters without being filtered or treated. Clean water for drinking and swimming depends on your careful disposal of hazardous waste. Emmet County Household Chemical Drop-off Days are held annually. For event dates and information about what is collected, call 231-348-0640. Charlevoix County HouseHold Hazardous Waste (HHHW) Drop-off Days are held in the spring and fall. Visit www.charlevoixcounty.org for additional information. 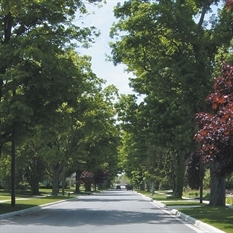 Tree-lined streets are as American as apple pie and baseball. Trees can also help when there is too much rainwater. Heavy rain fall can flow over the land picking up debris, chemicals, dirt, and other pollutants and wash them directly into storm drains, lakes, or rivers. Trees can help slow rainwater down and allow it to soak into the ground before reaching water bodies. Trees can increase your property value, too. Make an investment in your home, community, and clean water - plant a tree. Emmet Conservation District hosts an annual spring tree sale each spring. Visit their website for complete details. Charlevoix Conservation District hosts a “Tree Day." Visit their website for details and an order form. Is your car making noises like this? If so, it’s time for a tune up! The next time it rains, look down at the pavement on your driveway or the nearest parking lot. See any colorful oil rainbows? This is a sign that someone’s car is leaking fluids. These rainbows may look pretty, but they are composed of toxic materials, such as antifreeze, motor oil, brake fluid, and transmission fluid. When these materials wash down storm drains into lakes and streams they can be harmful to aquatic life such as insects, frogs, fish, and plants. If your car is leaking, repair the leaks right away or use a drip pan to catch leaks if repairs are delayed. Taking care of your car protects our waters. Follow these simple steps to clean like a champ and minimize your environmental impacts on Little Traverse Bay. Avoid washing your boat in the slip or dockside. Wash your boat on the grass or take it to a car wash to prevent cleaners from entering a storm drain. Wash your boat frequently with fresh water – rinsing after each use will reduce the need for cleansers, can help stop marine growth and will extend the life of the protective coating. If you use detergents, use phosphate-free, bio-degradable, and non-toxic cleaners sparingly to minimize the amount discharged into the water. Use alternative clean products such as baking soda, vinegar, lemon juice, and borax - and don’t forget about the power of “elbow grease”. Click here for even more clean boating tips. This brochure provides tips on preventing runoff from residential and commercial properties, farms, construction sites, automotive facilities, forestry operations, and others. Click here to view an online version.